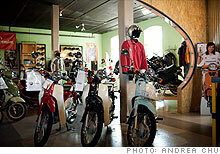 Our Makeover experts help a Virginia scooter shop find more clients and better staffers. Chelsea Lahmers, owner of Scoot Richmond, is looking to hire trustworthy employees and expand her scooter business. Parts from a 1986 Vespa. Scoot Richmond repairs scooters in addition to selling them. The founders of four breakout companies on how they built billion-dollar global brands like Costco and Re/Max from scratch. RICHMOND (Fortune Small Business) -- Outside a brick building in a drab industrial neighborhood at the edge of town, a kaleidoscope of color flashes in the early sun. It's the lineup of scooters that marks the location of Scoot Richmond. Inside, owner Chelsea Lahmers bounds around the store's large, open loft space answering questions and adjusting displays. Her short red hair is tousled from her scooter ride to work. Before opening Scoot Richmond in mid-2007, Lahmers, 32, ran a mail-order business that specialized in vintage scooter parts. "It was nearly impossible to make a profit in mail order," she says. "All my money went into inventory." 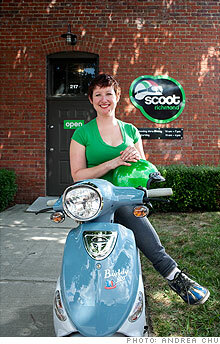 She phased out that business when she opened Scoot Richmond. Today the retail store sells two brands of new scooters, Genuine Scooter and SYM Scooters, as well as stylish scooter accessories and vintage scooters dating from the 1960s through the 1980s. 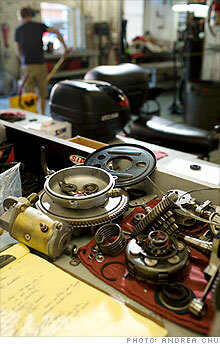 The company's repair shop handles mostly new scooter maintenance, although each year it makes use of Lahmers's remaining vintage parts inventory to perform about five time-consuming restorations of engines and bodies on old scooters. Lahmers starts by telling the group she has spent the past year trying to untangle the financial mess resulting from the alleged embezzlement. The experience undermined her confidence, Lahmers says. To add to her frustration, no arrest has yet been made, though a warrant has been issued in the case. Expert No. 1 is David Wilson, a laid-back entrepreneur who owns BikeBeat, a chain of four bicycle shops in Williamsburg, Va. Speaking of fraud, Wilson mentions that he's had customers who wrote bad checks. "This is a felony, so be aggressive," he says. "Go to the police department and make a friend in the white-collar crime department." Lahmers also wonders whether she's managing her current employees effectively. She sometimes hangs out with them at store-organized rides and other events. Is that kosher, she wonders? Wilson, 56, replies that it's okay to socialize with employees occasionally, but he warns Lahmers that she should always act like the boss. During job interviews, for example, she needs to stress that she's running a company, not a playground. "Your business and mine are similar in that there are slots where eccentric employees can fit in," he says. "But those aren't the personalities to build your business around." Wilson suggests interviewing each candidate several times, to make sure they're punctual and answer questions consistently. He urges Lahmers to be all-business during those meetings. "It's better to overstate your values and standards prior to hiring," he says. "Folks who aren't business-minded might be scared away -- and you don't need them." Wilson mentions that he asks all job candidates to assemble a bike because it shows him how they handle a challenge. Lahmers likes the idea, but she isn't sure how it could translate to scooters, which are mechanically more complex than bikes. "Maybe we could have them do an oil change or something," she says. Next up is Deb Angstadt of the Richmond management consulting firm Warren Whitney & Sherwood. When Angstadt, 49, asks which segments of the business are most lucrative, Lahmers looks to her mother. It turns out neither Lahmers nor West is sure where the highest profit margins lie. Angstadt then asks whether the company's restoration projects are profitable. Although Lahmers thinks they are, she doesn't track the hours her employees spend on them. Angstadt pushes, "So, are they a profit center or a marketing expense?" Definitely the latter, Lahmers says after a while. The only way to learn which business segment is most profitable, Angstadt says, is to create two sets of books -- one for repairs and another for retail sales. She recommends that Lahmers start by separating the two revenue streams using her QuickBooks software. She should then go through all line-item expenses to see which ones belong in sales and which in service. For example, Lahmers might need two inventory categories for oil entries -- one for retail sales and another for oil used in repair jobs. "If a shop employee runs into the store to grab a quart of oil when the shop's supply is used up, you 'sell' it to him at cost," Angstadt explains. To determine how profitable Scoot Richmond's repair jobs are, Lahmers must track not only the cost of the parts used to make the repair, but also the time that each worker spends on every job. Although Lahmers likes the suggestion, she laments that her repair-shop employees aren't meticulous about noting their hours (or their oil use). Both Angstadt and Wilson suggest she offer the head technician a bonus to encourage good performance and precise recordkeeping. How? Let him know that he'll get a bonus if his department performs a certain number of repairs within a specified time frame or if he ensures that employees file time sheets promptly. Once Lahmers identifies where her company is spending its money, she has to figure out how to boost revenues. Caley Cantrell, a marketing professor at Virginia Commonwealth University's Brandcenter in Richmond, is ready with advice. Cantrell, 47, is pleased that Lahmers uses Twitter and Facebook to promote shop events (Lahmers says she has personally sold four scooters through Twitter) and that she works her customer database by making phone calls to suggest services. But she could be doing much more. Cantrell points out that Scoot Richmond has a potential market of 25,000 students at Virginia Commonwealth University. She advises Lahmers to target them with a flyer that lists "five scooter selling points to discuss with your parents." Lahmers could also park a scooter next to a table at course registration. To reel in suburbanites, Cantrell recommends buying ads in newsletters that target community and recreation centers. The ads could point out that scooters are a great way for a 17-year-old to get to the pool or tennis practice. Lahmers could also consider donating a scooter -- or selling one at cost -- to be auctioned to benefit two area private schools, both of which hold popular fund-raising events in Richmond's suburban west end. "Make a list of what you'd want in return," Cantrell says. For example, Scoot Richmond might request that its logo appear in the program or that all attendees receive promotional flyers in their goodie bags. Lahmers should also ask for free tickets so she can attend the events with staff or key customers. "Tweet that you'll be at the fund-raiser, then make friends with the event photographer and get your picture on the benefit Website or in the local paper," Cantrell suggests. Two weeks later Lahmers reports that she has already made a new hire. "I'm more serious when it comes to disciplining him," she says, noting that when the new guy showed up late for work one day, she sent him home without pay. Lahmers has also made a list of organizations to contact for charity auctions and has begun recording both parts and employee time used for warranty repair jobs so she can better track costs. We will check back to see how the rest of her plans unfold.